You can kill yourself eating wild mushrooms. Or at the very least experience the most intense gastrointestinal nightmare of your life. Don't eat anything you haven't positively identified at least three times before. Never eat anything unless you're absolutely sure what it is. There are exceptions to every rule. There are no hard and fast rules when identifying mushrooms so we never assume anything. 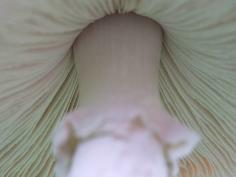 Don't follow generalizations such as "all white mushrooms are safe to eat" (they're not!). Also never follow superstitions like: "A silver spoon will turn black if stirring poisonous mushrooms while heating them on a stove. Otherwise they're safe to eat". These beliefs are unreliable at best. This page is just an overview on some mushroom identification tips.Don't eat any mushroom based on something you learned here. It's not a guide and not an exact key. For the best mushroom identification key on the web, see my links page. How to Learn - Some tips and tricks on how to get started. Poisonous Mushrooms - Why and how to learn about local poisonous species. Mushroom Genera - What is a genus and how it relates to the identification process. How to Identify - The 8 factors to examine when looking at wild mushrooms. So You Want to Learn...Now What? Learning how to identify mushrooms is all about repetition, practice, and hands-on instruction. To get started you'll need a book, an expert, and some quality time in the woods. First invest in a good wild mushroom identification book, such as the National Audubon Society Field Guide to North American Mushrooms (National Audubon Society Field Guides (Hardcover)) . Make sure it's up to date and relevant to where you live. Mushrooms of Southern China may have some great pictures, but it's not going to be much help if you live in New Hampshire! Once you have a local book, please read through it before you start studying outside. 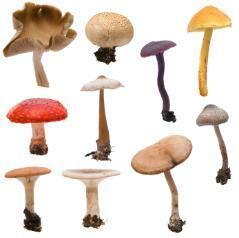 Read the introduction, which usually contains helpful mushroom classification information. Note how they've grouped individual species. What common characteristics do they share? Some say that a good book is all you need to start identifying mushrooms. I don't believe this. There are too many exceptions and things don't always look like the picture. Sure it's fine to take your book into the woods and see what you can match up, but to really know how to recognize mushrooms you should learn hands-on from a local expert. A local expert could be a trained or hobby mycologist. It's best to join a legitimate mushroom club and attend their forays (find one through NAMA). Most clubs hold guided forays where members and an expert collect specimens and identify them. These are usually very fun and informative, as mushrooms lovers tend to be an interesting lot! Other places to find hands-on instruction are colleges, workshops, and restaurants. Consult the Internet and local papers to find mushroom identification instruction near you. If they're growing in your area, chances are there's someone teaching about them. Just beware of people who are "know it alls" or who don't encourage caution. What happens after you have some good books and experience? Practice, of course! Take your newfound knowledge out into the woods and see how many mushrooms you can identify. Continue to attend forays. After a while certain characteristics will become apparent to you, and you can impress your friends with your command of Latin names. I think one of the best pieces of mushroom identification advice I ever heard was at a beginner's workshop in Athol, Massachusetts. The teacher encouraged us to "learn the poisonous ones first". Sound advice. Before you run off to fill your plate with black trumpets or try to memorize every bolete in your home state, learn to identify the mushrooms that can kill you. Education and caution are your best defenses against mushroom poisoning. While it would be difficult to learn every deadly mushroom in your home country, it's certainly possible to become familiar with the ones in your local area. Poisonous species vary in the intensity of their effects. Some will give you an upset stomach, some will have you endure much worse. Others contain toxins that will shut down the liver or kidneys, resulting in possible death. With these dangers in mind, it seems obvious that a novice mushroom hunter should start with the poisonous species. This will reduce the chance of fatal mistakes and increase your fungal appreciation, as many poisonous mushrooms are some of the more beautiful and interesting specimens around. Learn to recognize possible dangers by attending forays and reading books. Continue on to this page about poisonous mushrooms for more information (includes the destroying angel, death cap, jack-o'-lantern, and false morel). I've also included some poisonous mushroom identification advice for the deadly Amanitas. Once you've gained some knowledge on local poisonous mushrooms you can practice identifying others as well. The easiest way to start doing this? Learn to identify to the genus. Domain, kingdom, phylum, class, order, family, genus, and species. Is this bringing back bad memories of biology class? Don't worry, I'm not going to go in depth on all these terms! Genus is simply a taxonomic rank used to classify organisms. The rank of genus is one level up from the rank of species. Thus groups of genera (plural form) are made up of groups of species displaying similar characteristics. Lions and tigers are different species, but belong to the same genus (Panthera). When looking at a Latin name the genus is always the first capitalized word. Thus the reishi mushroom, Ganoderma lucidum, is a member of the lucidum species belonging to the Ganoderma genus. For detailed information on the taxonomic rank of genus see this Wikipedia entry. Amateur mycologists try to recognize specimens to the genus because it is usually the most specific mushroom identification one can make using a local guidebook. Determining a species is more difficult and may require examining microscopic characteristics. Practice looking at the different genera of local mushrooms and noting what distinguishes them. To make matters more difficult, mushroom taxonomy (the way they're named) is changing all the time. New species are being discovered, or old ones re-categorized as more is learned about them. The Latin name you learn today may not be correct in a few years. Despite common changes to nomenclature, the traits to look for when identifying mushrooms are fairly standard. Below are 8 things to observe when examining a new mushroom. Click on each for more detail. Gills - The ribs or feathers on the undersides of certain mushroom caps. Does the specimen have gills? Are they attached to the stalk? Stalk color/shape/markings - Tall and blue? Short and brown? No stalk? Habitat - What trees are nearby? What's in the soil? How moist is the environment? There's so much to consider with habitat! Time of year - Have they fruited after an early May rain or a cool September evening? Cap description - The color, markings, and shape of a mushroom cap can tell you a lot! Smell/taste - Only try a small amount. Is it fruity? Bitter? Doesn't it sound like I'm talking about a fine wine? After a while, noticing these things will become second nature. You'll begin to use your skills to see different genera in the woods. Click here for some examples of making an identification using this process. Something else happens when one learns more about mushroom identification. You notice more, observe more sharply. Your level of awareness increases when you're outside, your appreciation for nature deepens. The world gets a little bit bigger. I know mine did! If you're looking for a good identification book, check out National Audubon Society Field Guide to North American Mushrooms (National Audubon Society Field Guides (Hardcover)) .